Bill Bostock has been training in Kamon Wing Chun with Master Kevin Chan since 1991. Bill received his Black Sash Level I in 1997 and his Black Sash Level II in 2005. When younger, Bill trained in a hybrid style based on Wing Chun and other Chinese martial arts (called Tong Kuen Do, Way of the Chinese Fist). He also has his orange belt in Jiu-Jitsu. Bill is a qualified instructor in Ba Duan Jin (Golden Eight Exercises) and Zhang Zhong (Standing on Stake) Chi Kung (Chinese breathing exercises). 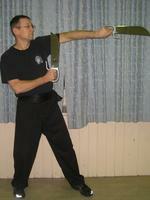 He offers private lessons and seminars in Chi Kung and Wing Chun. Bill runs classes in East Grinstead, Crawley and Horsham. Call 01342 328753. Bill Bostock is fully committed to the Kamon system of Wing Chun, as taught by Master Kevin Chan. A complete and highly effective martial art, it has evolved under Master Chan’s guidance for use in the 21st century and is continually evolving. The Kamon practitioner learns the complete traditional Wing Chun syllabus in depth, together with the best aspects of other fighting systems to make the individual well versed and flexible enough to adapt to any situation, making them unconventional and unpredictable. Adults: £35 - £40 per calendar month. Students in full time education: £25-£30 pcm. Bill Bostock is a qualified instructor in Ba Duan Jin (Golden Eight Exercises) and Zhang Zhong (Standing on Stake) Chi Kung (Chinese breathing exercises). Bill Bostock has been training with Master Kevin Chan since 1991. Bill received his Black Sash Level I in 1997 and his Black Sash Level II in 2005. When younger, Bill trained in a hybrid style based on Wing Chun and other Chinese martial arts (called Tong Kuen Do, Way of the Chinese Fist). He also has his orange belt in Jiu-Jitsu.